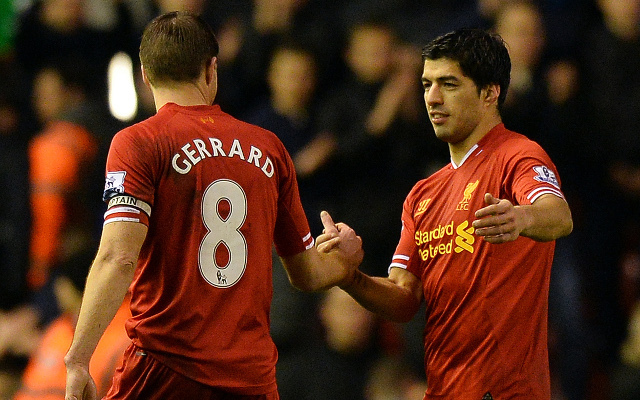 Arsenal were reportedly pushing to sign Luis Suarez from Liverpool in 2013, but the striker has now revealed how Steven Gerrard convinced him to stay. The Uruguayan international joined the Merseyside giants in 2011 from Ajax and left in 2014 after scoring 82 goals in 133 games. During his time at Anfield though, he only managed to win a League Cup in 2012, and that in turn perhaps led to speculation over his future with Arsenal eager to sign him. As noted by The Guardian back in July 2013, the Gunners made a bid of £40m plus £1 to activate a clause in Suarez’s contract to allow him to discuss terms. Ultimately, a move to north London never materialised, and Suarez has now revealed the conversation that he had with then Liverpool captain Gerrard which convinced him to stay at the club and snub the interest from Arsenal. “I’m about to go to Arsenal, forcing myself to go, and Steven tells me: ‘I promise that if you stay this year, you’re going to take off and next year you’ll go to Bayern [Munich], Barcelona, Real Madrid or whichever one you want, but stay this year because you won’t be better off at Arsenal,” he told Otro, as reported by Football London. Liverpool fans will undoubtedly love hearing such fascinating insight into their former captain’s leadership skills, albeit Suarez extending his stay at Anfield still didn’t lead to the success that they craved. Nevertheless, Gerrard prevented him from joining a direct rival at the time which could have led to a very different story in England, while also making an accurate prediction in that Barcelona signed Suarez in 2014 and he has since gone on to win countless trophies at the Nou Camp.